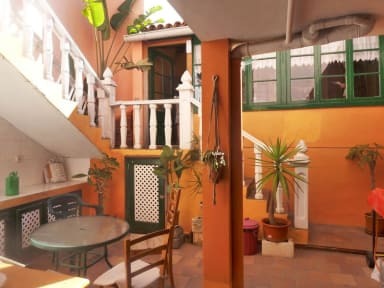 Backpacker Style Accommodation with relaxed ,homey atmosphere in a 100 year old canarian house situated in the lush, stunning landscape of the North. Located in the historic centre of La Orotava,the islands most picturesque town. Away from the tourist masses, yet close to Beaches incl. famous surf-spot El Socorro. Typical Canarian neighbourhood with local Bars and Restaurants that serve very affordable food and wine. + Great roof terrace with views of mountains, sea and the town. + Free use of hiking boots, a mountain bike, warm cloth, hats, gloves if you want to go to Mount Teide. + Perfect location for hikers set right in the middle of the three main hiking areas: Anaga, Teno and Teide can be reached in about an hour. + Community kitchen free coffee, tea, oil, vinegar...SUPERMARKET just around the corner. + No party hostel we try to let ourselves sleep between midnight and morning. + Lots of information about hikes, buses, places to go from the Hostel owner who is also a Hiking Guide. Important: As there is No permanent reception, let us know in case your stated arrival time changes. Not a real Party Hostel - we try to let each other sleep between midnight and 8 in the morning. Check in time: 9 to 13 and 18 to 22 hours.